UPDATE (15 November 2016): Playeum's newest exibition, 'A World Full of Stories', opened to public on 15 Nov 2016. UPDATE (21 July 2016): THREE more new attractions - two of them bring FREE for ALL - have been added to the list, bringing the total of attractions that opened this year to 15! We are closing in on the first half of 2016 and already, a flurry of new kid-friendly attractions have opened in Singapore. Who says Singapore is boring for kids? Learning need not be confined to the classrooms and books, because kids learn a whole lot better than getting outdoors and making sense of the world through play. So the next time the holidays or weekends come along, here are 15 new adventures - of which 5 are FREE for all! - to discover together as a family this year. Opened in February 2016, PIP’s PLAYbox is an activity space tucked away on Level 4 at the Esplanade designed especially for kids - AND it's all FREE! There is a kids craft station where kids will be able to churn out their own handicrafts. The crafts will vary throughout the time of year and depending on the season. Since it is nearing Easter now, kids will be able to make their own paper bunny. If you know what is an OHP (Overhead Projector), you are probably as old as me. In one corner of the massive room stands an OHP where kids will be able to indulge in some shadow play. PIP's PLAYbox also stocks a massive library of children’s books, complete with plenty of personal - and some secret too! - speaces for kids and parents to read together. Need a little fresh air? Head to the mini playground just outside where kids can get active and even crawl inside the brick-red tower to get a kaleidoscopic view of the sky above! Children’s toilets (shrunk down to the little adult size) and a nursing room are conveniently located just outside of PIP's PLAYbox. 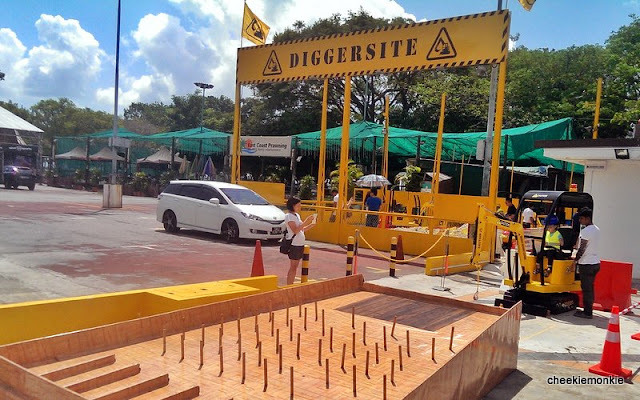 Located at Raintree Cove, East Coast Park (near Burger King and beside East Coast Prawning), Diggersite offers little diggers to realise their dream of operating a real-life working excavator! There are a total of three stations - 2 outdoor and 1 indoor. The favourite station arguably has to be the enclosed sandpit, where kids are tasked to scoop bricks out while operating an excavator. 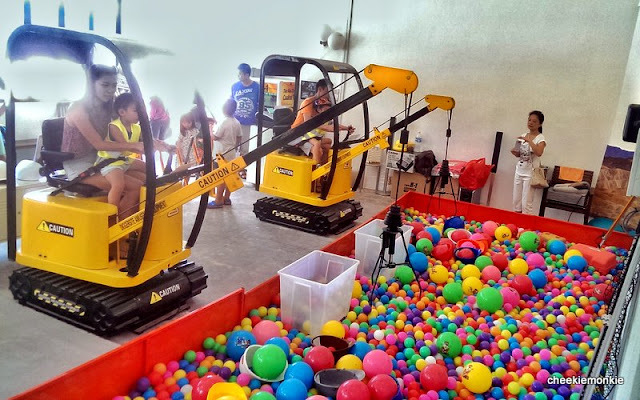 The indoor station allows kids will be able to grab colourful balls using a giant claw from the comfort of a digger. 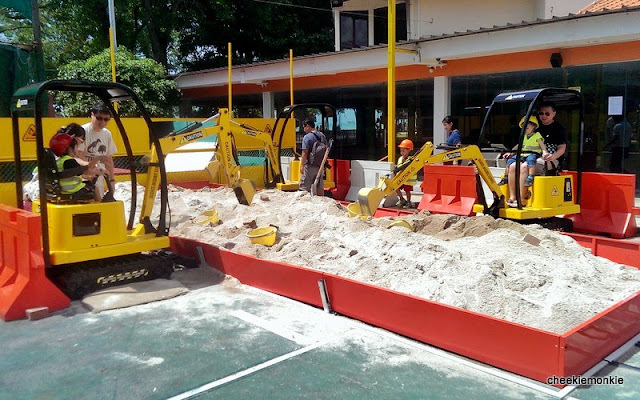 Considering that the Diggers work like a real excavator with their hydraulically controlled arms, it is no wonder they are a hit with the kids! Cost: $7 per ride (5 minutes). Bundle promotion of $18 for 3 rides. Launch fireworks using your body, watch your doodles spring into life from a piece of paper or marvel at how your paper plane transforms into an animated jumbo plane on the screen. Welcome to Singapore's first digital media edutainment facility, MOSH!, an indoor playground with no slides or climbing structures. Instead, MOSH! is home to FIVE digital interactive activities which allow the little ones to create imaginary worlds of their own in an immersive virtual environment, designed to empower creativity through free play and expression. Top two activities guaranteed to keep the kiddos enthralled include the Doodle Aquarium where they will be able to draw anything they want on a piece of paper, scan it and watch it join the underwater world on the screen AND Paper Plane Adventure which tasks them not only to fold their own paper planes, the paper planes transform into digital actual planes when they throw them against wall! *MOSH! Playtime of 2 Hrs will apply during weekends and public holidays. Spanning 56.8 hectares (half the size of Gardens by the Bay), Kranji Marshes is the largest freshwater marshland in Singapore. It is home to a combination of lush, marsh, woodland and grass habitats with more than 170 species of birds, 54 species of butterflies and 33 species of dragonflies lies in the north-western part of Singapore. And not only is it open to everyone, it is FREE to visit! There are two main areas – one that is open to public and the core conservation area which can only be accessed via guided walks. For the public walk, the start journey begins at Kranji Gate which is located at the end of Neo Tiew Lane 2 (beside D'Kranji Farm Resort). The walk is a relatively straight-forward linear one, a 1km route which ends at 10-metre tall Raptor Tower which offers a panoramic view of the entire Kranji Marshes. Suffice to say, scaling the tower is the highlight for the kids! To complete an educational day out, be sure to head to the nearby Marsh Station where they can learn more about the birds and their respective bills and feet. For a glimpse into the original interiors of Chinatown’s shophouse tenants in the 1950s, visit the Centre as the colourful past of Chinatown comes alive within the walls of these three beautifully-restored shophouses on Pagoda Street. Re-opened in February 2016 after 1.5 years of renovations, every nook and cranny in the Chinatown Heritage Centre pulsates with the memories of yesteryear, offering an experience like no other as one is transported to Chinatown in the budding years of Singapore's establishment as a seaport. One thing I love about Chinatown Heritage Centre - instead of just displaying every information in panels and words, everything is recreated from scratch to depict the actual living conditions back in the 1950s, from the decorations, furniture, the cramped living conditions - and even the toilet of yesteryears! living conditions were like, allowing the kids to gain a deeper appreciation for the resourcefulness, resilience, and sense of community that came with communal living. Other galleries depict the stories and struggles of the many “Sinkheh” (new migrants) – risking life and limb to embark on an arduous journey from the various Chinese provinces to the promised land of Singapore – including the raw, seedy and underground practices of gambling dens and secret societies. Best to visit with the grandparents as Singaporeans and PRs who are 60 years old and above enter FREE (valid until 31 July 2016)! Opening hours: 9am - 8pm daily. Closed on 1st Monday of every month. The newly-opened Waterway Point in Punggol is home to a rather impressive FREE Indoor Playground. Adopting an 'Alice in Wonderland' theme, the fully padded WONDERLAND indoor playground features creatures like a bunny, butterfly and caterpillar set in a garden setting - and a mini slide! Together with sensory play boards mounted on the walls, the play area should appeal more to toddlers and children aged below 7 than older children. UPDATE: Happy Park, the outdoor playground at Waterway Point, has opened too! More photos HERE. The newest kid on the block, Future World is ArtScience Museum's latest permanent exhibition and officially opens on 12 March 2016. Kids will be able to imagine, play and explore in Singapore's largest digital art gallery, where 15 digital art installations come to life through cutting-edge science and technology! Some of the really interesting installations include Crystal Universe (above) where you become the centre of the universe by stepping inside a scintillating and dazzling world of 170,000 LED lights and Light Ball Orchestra (below) which blends vivid lights with beautiful music together to create an orchestra of colours and sounds that change constantly. Children can experiment with creating their own music freely as they run and play among a multitude of light balls, changing their sounds and colours as they touch or throw them around! But perhaps, the one installation that will capture their imagination is Sketch Town, where kids will be able to colour in and draw objects such as cars, buildings and sapceships. Scan these 2-D pictures and they become animated, and join the large town projected on a screen. Kids can even touch them as they move along for an added experience! Even better, the Sketch Town Paper Craft enables the kids to print their drawings into paper craft patterns, which can then be brought home to be assembled into 3-D models! Oh and did you know? Children get FREE entry every Friday (up to four children under 12 years old) with every adult ticket purchased! KidZania Singapore comes with NO rides or arcade attractions at all! Instead, kids get to participate in a variety of role playing activities specifically designed to educate and inspire kids aged 4 to 17, creating a kid-centric city experience from arriving at the airport, to visiting a city centre and exploring the city streets. All in all, there will be a diverse range of over EIGHTY role-playing activities where kids will be able to earn money in the form of KidZos currency and use it to buy stuff or save it in the bank! So yes, KidZania Singapore is THE place where kids ditch their parents and go looking for JOBS! And trust me when I say the kids can never get enough of the job-hopping. Check out my ultimate everything-you-need-to-know guide HERE! Playeum is NOT an Indoor Playground with the tallest slide or biggest ball pit in Singapore. Instead, it is Singapore's first Children's Centre for Creativty and an independent charity which champions children through play and creativity. Located at Gillman Barracks, Playeum is a museum without walls which hopes to inspire children through self-directed exploration and learning and in the process, establish a culture of meaningful and impactful play. Full of Stories’ consists of ELEVEN installations in total! Check out my preview guide HERE! *Free Parking on Saturdays (11am-7pm), Sundays and Public Holiday. The 5-storey SAFRA clubhouse in Punggol will boast a first of its kind indoor water playground in Singapore! With an ‘Enchanted Deep Sea’ theme, the mega three-storey facility is equipped with fun and interactive water play elements, including eight different play decks, five slides and a themed splash pad. Check out everything you need to know about the indoor water park HERE! Flutter your way to the Science Centre Singapore’s brand new colourful display where kids can learn about the fascinating transformation of a butterfly from an egg to a beautiful winged adult. They will be able to gain a deeper insight on how the butterfly behaves, interacts with the surroundings, and survives each stage of its life cycle to reach adulthood. The highlight of the exhibit is undoubtedly the Live Butterfly Enclosure. Step into Singapore’s first and only indoor butterfly enclosure, where both humidity and temperature are carefully regulated to ensure that both plants and butterflies, sharing a close-knitted relationship, do well. 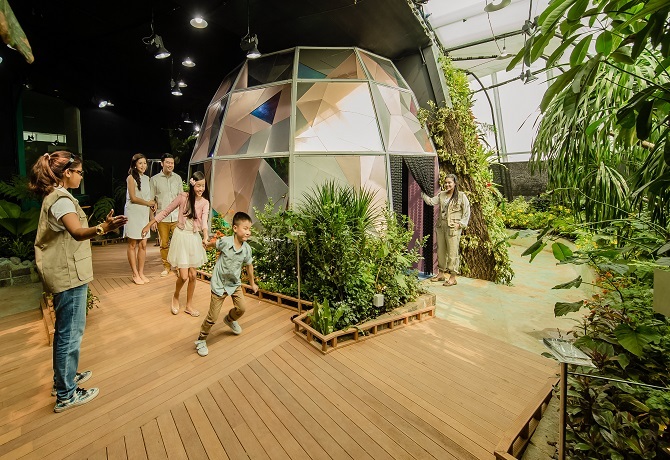 With more than 500 butterflies from around the region including Indonesia, the Philippines and Australia, the 600 square metres enclosure is aimed at providing an immersive experience for both children and adults, in order to bring them closer to nature. BOUNCE, one of the world’s best indoor adrenaline-packed arena that combines recreation, fitness and fun opens at the heart of Orchard Road as the newest trampoline park in Singapore! Located at Cathay Cineleisure Orchard, BOUNCE features three zones on a 24,000 sq ft arena which consists of trampolines (including an Olympic grade, high performance area), X-Park (a ninja warrior-like obstacle course & the first in Asia), and Leap of Faith. BOUNCE Singapore caters to almost everyone from kids aged three and above to youths, adults and fitness enthusiasts. And if you are planning to take the kids, there are SEVEN activities at BOUNCE for them to go bonkers over. Read my review HERE. Opened in April 2016, is Singapore’s first nature park with separate mountain biking and hiking trails, measuring 1.6km and 2.1km respectively. If you are planning to bring the kids for their first taste of hiking, great news - the hiking trail is slightly undulating and pretty straightforward. For more adrenaline thrills, the mountain biking trail, which forms a loop, consists of sections that are mostly classified as moderately difficult, with one extremely difficult section. Boasting a total of 24 lanes, Orchid Bowl @ SAFRA Punggol has revolutionised the bowling industry with the widest and most innovative variety of on-lane entertainment. 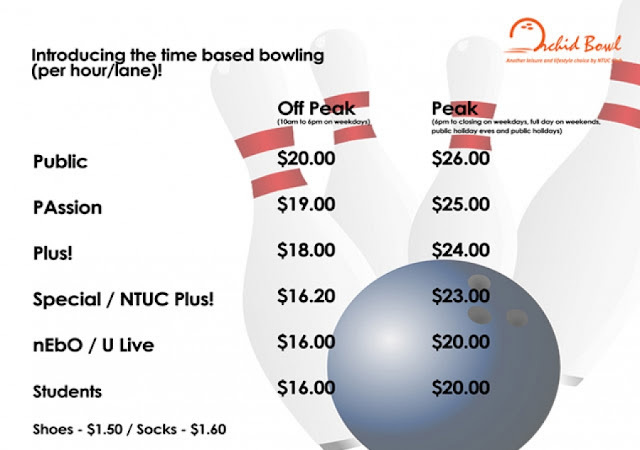 Besides the standard family-friendly features like lighter bowling balls and bumpers along the lanes for kids, the bowling centre provides the wildest - and sometimes, wackiest - variety of one-lane entertainment options for families. It delivers extreme fun for everyone by offering themed games, personalised animation and different game formats. Families will be able to choose from over 18 different themes with over 1,000 unique animations ranging from fairy tales, halloween, sports and many more... and even take their own photos and attach them to the respective bowler's name! And did I mention there is even bowling in glowing lighting too? But perhaps the most fun bit is the inclusion of 4 mini games that allow kids to bowl in a way that is easier to understand, faster to finish and uniquely aligned to their taste, much like how they can build their own Monster by striking down pins. Yes, definitely the MOST kid-friendly bowling alley in Singapore yet! After 4 years of closure, Marine Cove at East Coast Park opens once again! And this time, it sports several brand new amenities for families - including a massive children's playground. The colourful 3,500sqm children’s playground is home to a range of play equipment suitable for children of varying ages with the 8m high tower being the focal point of the playground. Modelled after a lighthouse, the 3-storey tower is suitable for older children aged five to twelve years old, it consists of many play elements including three slides of different levels, a rope bridge and climbing net courses. In addition to having a gated play area for toddlers, the playground consists plenty of inclusive features which allows special needs and wheelchair-bound kids to be able to join in the fun as well. Read my detailed review HERE. The bar has indeed been set very high with the introduction of this FREE playground for all. Plus, all of the 5 eateries at Marine Cove have also incorporated kid-friendly elements, with some even having play areas within the restaurants. SO... HOW MANY HAVE YOU BEEN TO??? Great! More nice places for the kids! Thanks! Thank you for sumarising these exciting new play areas for kids. Thanks for sharing, especially the nursing room part.